You may not be aware that May is National Salad Month. So we decided to dedicate this week’s blog to to salads. I am a big fan of salads if they are done properly. There are a lot of ways that you can make a salad extremely healthy, starting with the foundation of it is. I recommend salads that are made of field greens: kale or spinach or some combination of the three. One way you can really ruin a salad is by using iceberg lettuce as the foundation. Iceberg lettuce has been shown to have almost no nutritional value without much in the way of vitamins or minerals. My wife is a big fan of chopped salads. She chops up broccoli cauliflower, a non-traditional foundation for a salad, that makes a very hearty salad. Let’s talk about a couple ways that can you really ruin a salad. One way is to add the wrong type of dressing. Now this may get into the weeds a little bit for some people, but I think it is important. You can a have very healthy salad and then put ranch dressing on it with high fructose corn syrup, as well as vegetable oil made ingredients in the ranch, and your health benefits go right out the window and are actually worse for than not eating a salad at all. All the dressings that I recommend are oil and vinegar or a type of vinaigrette. My wife makes a really great dressing with mustard, garlic, salt, pepper, oil, and vinegar. When choosing your dressing, make sure your oil is something that is rich in Omega 9 or Omega 3’s such as Avocado oil, olive oil, coconut oil, or something along those lines. Avoid any grain oils such as corn oil, soybean oil, or the sort of thing. Another way that you can really ruin a salad in a hurry is with what you top it with. Salad can be made into a very healthy meal by topping it with some sort of meat, but if that meat is deep fried such as crispy chicken or something along those lines, your health benefits again, can go right out the window. So this gives you some things to pay attention to when building a healthy salad. One restaurant that I highly recommend is Jason’s Deli. They have extremely healthy options, many of them organic. Another option for having a great healthy meal and a great place to get a salad is Whole Foods. They have an extensive salad bar as well as food bar with many healthy options on it. If you are out at a restaurant, you may not be aware that many fast food places now allow you to sub your fries for a side salad. 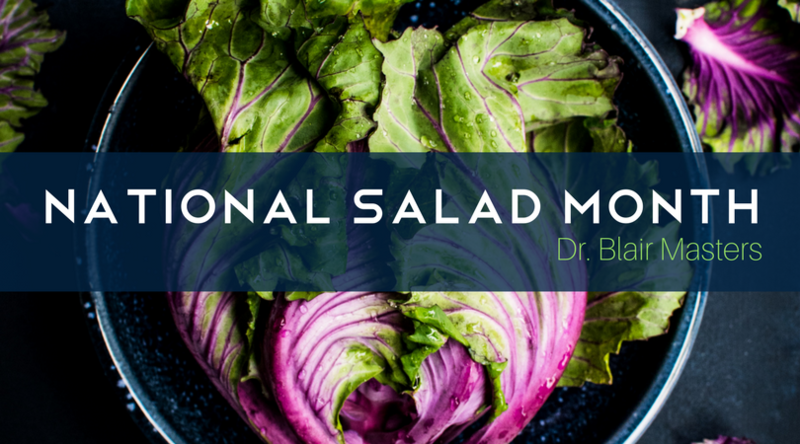 So celebrate National Salad Month this month by enjoying a healthy salad! If you need help getting started with eating healthy, please call our office at (479) 443-0800 or click here to set up a nutritional consultation!